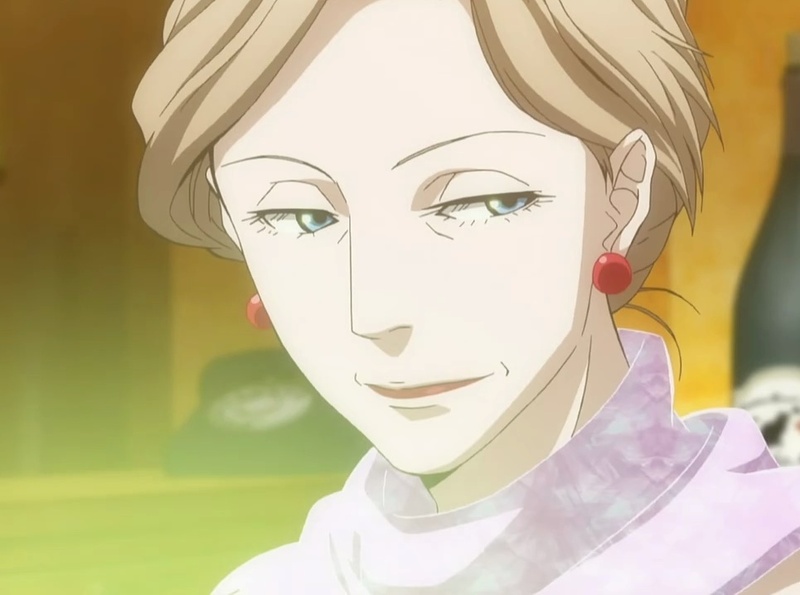 Episode 10 of Ristorante Paradiso, “Hidden Love”, begins with a certain lady frequenting the casetta dell’orso showing an intense interest in Luciano. He is quite aware of the attention, but ignores it. The rest of the staff is aware of it as well, and Vito talks about how her name is Savina and that she used to be a violinist. Of course, Vito also thinks it a waste how Luciano simply ignores the attention. Given how Luciano tries to ignore Savina, Nicoletta wonders if Luciano plans to live the rest of his life alone as a widower, to which Claudio suggests is probably the case because Luciano loved his late wife so much. This is troubling for Nicoletta, given how Claudio still wears the wedding ring from his failed marriage with Gabriella. After the break, Luciano is walking the streets with his daughter and grandson. Margerita will be part of one of the groups that will have a concert next week, so she invites her father and asks him to look after Francesco for a while because she will be busy practicing. Of course, this means that Francesco will be hanging around at the restaurant while Luciano works. It turns out that Margerita is not the only one who wants to invite Luciano to the concert. A group of musicians that Savina helps out with will also be playing at the concert, and Savina tries to seductively invite Luciano. However, he refuses citing that he already has plans for the day, without mentioning that it’s at the same concert with his daughter and grandson. This was overheard by Nicoletta, who frantically (and comically) heads into the kitchen when Luciano heads her way to hide the fact that she was overhearing them. One night not long after, Margerita’s husband is free for the day from his work and is at home, and we finally get to see what he looks like. When Margerita places the tickets for the concert on a dresser and takes Francesco to the kitchen for some food, Francesco notes that they were the same sort of tickets he saw at the restaurant. Margerita’s husband realizes that a patroness must have invited Luciano and seems to be happy for him, although Margerita shows a lukewarm response. When the husband is alone with Luciano, he mentions how he thinks everyone needs love, even if Margerita might think differently with respect to Luciano with how she is staying with her father thinking that he would be lonely after losing his wife. On another day while the restaurant is being prepared to be opened, Nicoletta tries to convince Luciano to go out with Savina to the concert. Although her attempt at meddling sort of annoys Luciano, he does end up giving her the extra pair of tickets to the concert he got from Savina, since he has his own tickets from Margerita. He may not be saying it in as many words, but Luciano seems to be supporting Nicoletta’s love for Claudio. He even goes as far as to say that she shouldn’t do something as boorish as going to the concert with another woman. While Claudio is walking the streets on a day off, he surreptitiously encounters Gabriella carrying far too much and needing an extra hand for her cellphone. After helping her out with carrying the groceries, Claudio is invited into his ex-wife’s home for coffee, where he ends up being very awkward in contrast to the comfortable Gabriella. This suggests Claudio indeed still has feelings for Gabriella, feelings which are not reciprocated anymore. He remembers about the time the two ended their marriage on friendly terms. Incidentally, it’s mentioned that the marriage was short in the flashback. This answers something I was wondering about: Claudio must have married Gabriella after being hired at the casetta dell’orso. He must have gotten to know her through Olga, given how Olga and Gabriella work at the same law firm. After the break, Nicoletta notices how something seems to be bothering Claudio. She would be even more concerned if she knew what was bothering him. Others also notice, with Luciano asking if Claudio would want the day off. While Claudio says that he’s fine, he does ask whether Luciano plans to live on without a partner. Luciano points out that the situation between himself and Claudio are different: his wife had died and feelings have remained frozen, but for Claudio, things will continue to change. Later, while Claudio continues to think while watching the wedding ring still on his hand, Nicoletta shows up to invite him to the concert. But she loses her cool and chickens out, and instead offers to help with anything he might need as a colleague at the restaurant. At least she nicely deflects the potential double entendre (“Jump into these breasts if it would make you comfortable!” sounds even worse than in the original Japanese.) Nicoletta isn’t worried about Claudio refusing the invitation, but rather a feeling of inferiority that she can’t be as cool inviting Claudio as Savina was inviting Luciano. I also suspect that Nicoletta may have backed out precisely because Claudio was not the sort to refuse a date despite any lack of feelings, even if she does not realize it. On the day of the concert, Margerita is among the violinists playing with Luciano and Francesco among the audience. After the concert, Savina discovers Luciano with Francesco, the latter who runs off to see his mother. 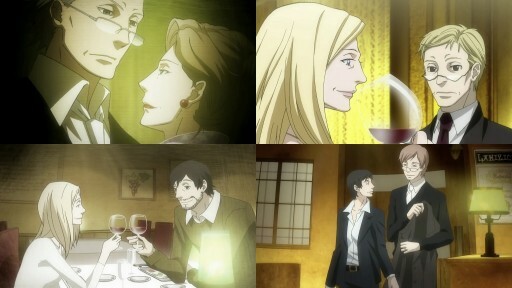 She is amused that his “date” turned out to be his grandson, and is happy that there doesn’t seem to be a rival for his affections. However, she soon realizes that this may not be the case from Luciano’s reaction. She tries to kiss him, although she does not end up kissing him in the mouth (whether she kissed him on the nose or forehead or not at all is unclear), and she seems to realize that trying to woo Luciano is hopeless given his passive rejection. Soon after, Francesco returns with his mother in hand, along with Nicoletta and Marina. Of course, Nicoletta earns an accusing stare from Luciano for being so boorish. It quickly turns out that Margerita knew Savina, who is the wife of the owner of the studio where Margerita practices the violin. Nicoletta is totally shocked at learning that Savina was married. And Savina totally gives up on pursuing Luciano, realizing that he must have known her marital status and wondering if things would have been different if she was a widow. I think things would have been the same, and I suspect she knows it, too. With Luciano, Francesco, and Marina going one way to their respective homes and with Nicoletta and Margerita going their separate way, where Margerita is heading to the after-concert party, Nicoletta asks how long ago Luciano’s wife died. She died nine years ago, about the same time Margerita learned she was pregnant, and while at the time Margerita wondered if the baby might be like a replacement for her mother if it was a daughter, Margerita is glad that it was a boy. She now realizes that for Luciano, no one could replace his wife. She also wonders if it might be better if her father had a lover, but she is quite sure that it won’t happen with how he loves his late wife so much, something Nicoletta realizes as well. Back home, Luciano watches over his grandson with satisfaction while they’re watched over by a picture of his wife in the background. Since the day of the concert, Savina has not once been back at the casetta dell’orso. As Nicoletta thinks about this, she also thinks about the various forms of love she has seen and wonders, at which point the episode ends. The next episode is sadly also going to be the last episode of Ristorante Paradiso. Will Claudio be able to get a grip on his feelings? Will he accept Nicoletta? And will the secret relationship between Nicoletta and Olga finally be revealed to everyone? Whatever happens, the preview indicates that there is going to be at least one tense scene at the restaurant, something that will have Nicoletta dump food on Claudio’s head.